I’ve always been one to enjoy talking to taxi drivers. More often than not, they’re quite happy to chat, and will have interesting stories to tell. Recently, more and more of these conversations have been about the mounting pressure and competition from Private Hire Vehicles (PHVs) apps like Uber and GrabCar. It’s clear that taxi companies are struggling under the pressure of unregulated transport service providers entering the market. And I can see why, because I’m also one of those who have hopped aboard the PHV train. Or car…? The thing is, Uber and GrabCar rides are just much more comfortable, because they provide the convenience of pickups at your booking location so that you don’t have to wait by the side of the road to try to flag down a taxi that may not even stop, or call a taxi operator that takes forever to pick up. Ms Chen, a longtime taxi commuter who took her first Uber ride this week, shared that although she is supportive of taxis, the last straw was being put on hold by the taxi company call centre for ten minutes, twice, before being informed that there were no taxis available. The contest between taxis and PHVs has played out differently in various countries. As of 28 May this year, Uber’s services were available in a whopping 300 cities across the world. But not everyone is happy with Uber’s rising popularity. 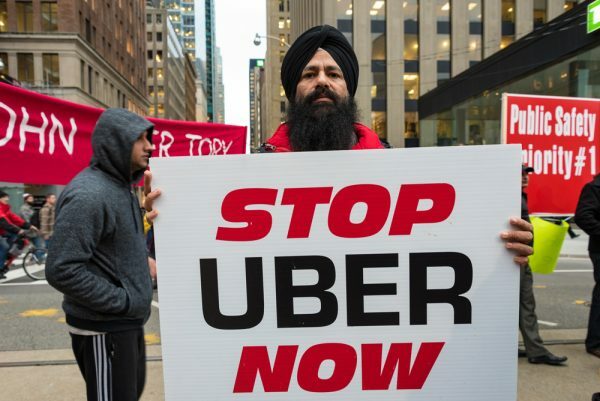 Anti-Uber protests have been staged in European countries like Germany, Spain, and England. A few cities and countries have even banned Uber from operating under their jurisdiction. That’s because PHV companies like Uber and GrabCar have barged into the well-established taxicab industry from a very unique and controversial new angle. But the question is, how will this affect commuters? But PHV companies are not bound by the same regulations as taxi companies, so commuters should know that their pricing models can be very different. For example, PHV companies implement surcharges not based on fixed times of the day, but on fluctuations in demand throughout the day. During periods with an exceptionally large number of bookings, such as Friday evenings, Uber will implement a x1.5, x2, or even x3 fare multiplier. Likewise, GrabCar also levies a surcharge on trips made during peak demand periods. One interesting difference to note is that GrabCar’s fare is a flat rate that’s calculated upon booking, so at least there’s no “bill shock”! Nelson, who has been driving a PHV for two months, gave two examples of how the PHV surge pricing model causes discrepancies in pricing. Once, he picked up a fare via the Uber app, from Shenton Way who was going to Orchid Country Club (a distance of about 23km). The surge pricing multiplied the fare 3.2 times, for a total fare of $139. In comparison, the fare for this route in a GrabCar would have cost just $40-$60. Another time, Nelson drove a different passenger from Shenton Way to Choa Chu Kang (also about 23km away). On Uber, the fare amounted to $98. On Grabcar, it would’ve been less than half of that – just $45! For an unaware passenger, receiving a bill like that could really have been a nasty shock. Max Tan, a commuter who has switched from taking taxis to booking PHVs, cautioned that PHV customers should be aware that PHV apps use surge pricing. But he says that Uber is transparent about surges, so much so that passengers have to acknowledge acceptance of the surge pricing by typing in the fare multiplier displayed during booking – almost like a contractual agreement! GrabCar, on the other hand, doesn’t have this surge “check”. Instead, any additional charges are included in the fare estimate and displayed, without a cost breakdown, during booking. This system isn’t as transparent, so Max’s advice for commuters is to compare pricing before booking. So the lesson I learnt was that PHVs can be cheaper than taxis if you’re careful. We just have to be smart commuters, and know when to use PHV mobile apps, and when to hail a regular taxi. With surge pricing, you can avoid situations where taxi drivers refuse passengers because it’s 5.59pm and they’re waiting for the peak hour surcharge to kick in. The multiple advantages of PHVs over conventional taxis have really taken some serious business away from taxi drivers, most of whom are not very happy about it! Some taxi drivers, however, have chosen to turn away from driving conventional taxis and embrace the PHV culture instead. Mr. Suhandi has been an Uber driver for a few months now, but he used to drive a taxi. In fact, he had been driving a taxi for 20 years when he met with an accident while riding his motorcycle in 2012. For three years, he worked as a mechanic while he recovered from his injuries. Then earlier this year, his brother introduced him to Uber and he has since been driving for the company, while still holding his vocational license. Now, Mr. Suhandi works part-time in the mornings, and drives an Uber from 3pm to 11pm. He makes about 15 trips a day (about $300 total revenue). After deducting costs for vehicle rental, petrol, and Uber’s 20% cut of the fare, Mr. Suhandi is left with about $100. When he factors in Uber’s cash incentives for hitting certain goals, he takes home earnings of $250 to $300 per day. For Mr. Suhandi, a part-time Uber driver, the income is good. He estimates that, if he drove an Uber full-time, Uber’s incentives and surge pricing could earn him more than he used to make as a taxi driver. He says taxi rental costs are becoming more expensive. A check with two current taxi drivers, Ms Ong and Mrs Chua, confirmed his claim. Both of them shared that ten years ago, their taxi rental was about $70 a day, but now they are paying about $140 a day. What caused the rise in taxi rental cost? Taxi drivers have to pay high rental costs so that taxi companies can make a profit (red bar). 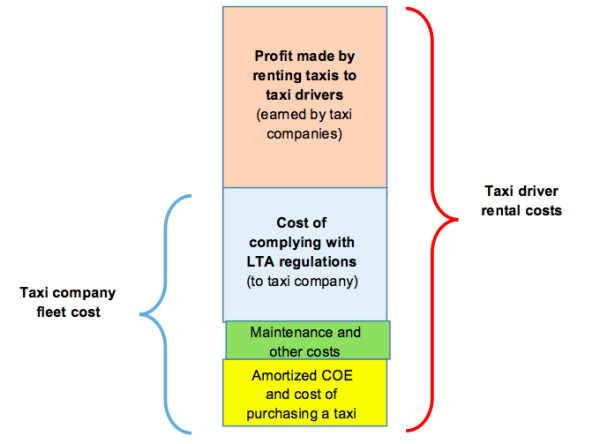 Taxi companies also pass on the cost of complying with Land Transport Authority’s (LTA) regulations (e.g. taxi availability standards below) to the taxi drivers (blue bar). Taxi companies need to attain at least four out of six ‘Passes’ in each of the two indicators. This year, taxi companies Prime, Premier, and SMRT were all fined for not meeting the standards. On the other hand, PHV companies do not have to adhere to these standards. Taxis also cannot be converted for private use. On the other hand, a PHV used by Uber or GrabCar drivers, which is really just any private vehicle, costs less to rent, and comes with 24-hour commercial insurance coverage. One of my favourite reasons for booking a PHV over a taxi (and I suspect that many others feel the same) is because I can pay by credit card through the app. Mr. Suhandi also thinks of this as an advantage, because it means that he doesn’t have to keep a stash of cash in his vehicle for change. It also eliminates situations where his passengers are unable to pay after the ride, such as when they suddenly realise that they’ve forgotten their wallet, or when the NETS machine breaks down. Although PHVs cannot pick up passengers by the road or at taxi stands, this could actually be a blessing in disguise. Mr. Suhandi likes the fact that he can leisurely wait around Changi Airport, and then just drive over to pick up the passenger upon receiving a booking, instead of having to join the long queues of taxis waiting for passengers. Mr. Suhandi is confident that more passengers will start to use third party apps as they’re unhappy with choosy taxi drivers and the difficulty of booking taxis during peak hours. But even with the perks that come with being an Uber driver, not all of them are 100% satisfied with the experience. Nelson (remember the other Uber driver we spoke to?) plans to quit driving a PHV eventually. Unlike Mr. Suhandi, he feels unhappy about having to wait for bookings and not being able to pick up passengers on the fly. He even went as far as to compare PHV companies to loan sharks, complaining about the 20% cut that Uber takes from each trip. Although taxi drivers do not have to give up a cut of their earnings to their taxi companies, they are faced with much stricter regulations. And for good reason! Of course, safety is also one big concern for passengers when it comes to jumping into a stranger’s car, and this is one area where taxis still have a huge advantage over PHVs. Taxi drivers have to renew their vocational licenses every three years, which mandates attending a refresher course and undergoing a complete medical check-up. These licenses could be revoked at any time, if a driver is found to have flouted the rules. It may sound overly stringent to some people, but it ensures that taxi drivers remain safe, reliable, and consistent. PHV drivers, who do not need to hold Taxi Driving Vocational Licenses to begin accepting passengers, cannot be expected to follow the same strict standards for safety. I have encountered countless dangerous drivers barreling their way down the roads of Singapore, and it scares me a little to think that any one of them could become my Uber or GrabCar driver! Not surprisingly, there’s been a call from taxi drivers through NTA to the government to enforce that PHV drivers are licensed, on top of the request to reduce the unnecessary and irrelevant regulations which saddle taxi drivers with higher costs. Do you think that it is really efficient for taxis to drive at least 250 km a day (not to mention the petrol and time wasted)? But which way should the pendulum swing? Should the LTA enforce the same strict taxi regulations on PHV drivers? Or should they loosen or remove taxi regulations for taxi drivers? Personally, I think that there is some leeway on both sides, but no matter what, the security of passengers should always be number one. 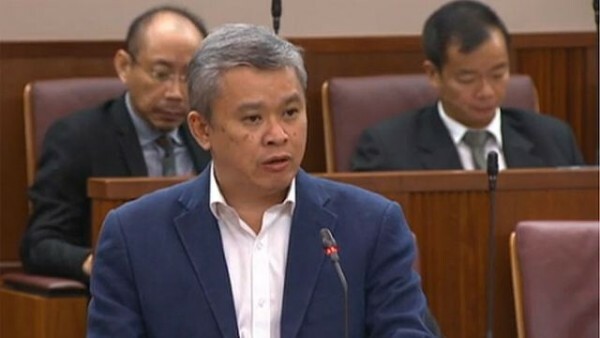 Nelson, who has worked with both Uber and GrabCar, said that although vocational licenses are still not mandatory, Uber is becoming generally more scrupulous with its drivers. He received a message from Uber requesting that he register all relevant documents, such as his driving license, vocational license, NRIC etc. 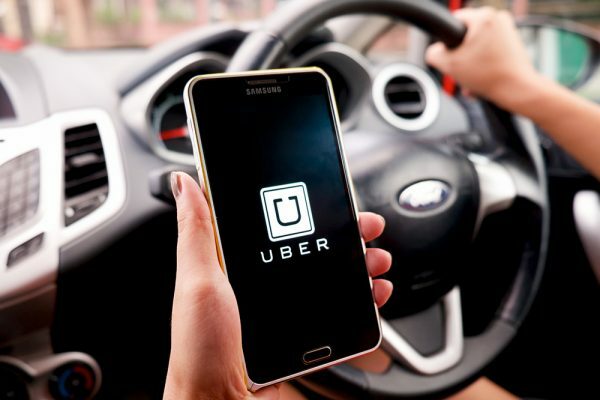 It seems that Uber has begun to look into the implementation of vocational licensing for their drivers, and Nelson is of the opinion that Uber drivers without Taxi Driving Vocational Licenses may soon need to attend courses to obtain them. GrabCar, on the other hand, has not made any such moves according to him. Safety aside, there are also other instances where things could go wrong. “For taxis, commuters can approach LTA or taxi operators directly for help or liability claims whereas for existing PHV service providers, it is currently unclear as to who the commuters can make claims from: the app providers, car leasing company, or drivers,” said Mr. Ang. If a taxi carrying a passenger meets with an accident, the taxi driver pays an excess of around $1,000 while the taxi operator’s insurance will foot the rest of the bill. However, if this passenger were to ride in a PHV, the PHV driver (as a sole proprietor) will have to fork out $12,000 to $15,000 before the commercial insurance will pay out. Uber and GrabCar are absolved of any claims because they are not taxi companies. So if your PHV driver doesn’t have the money, you may have to wait a long time to claim back expenses from your medical bill. As a commuter, do you think safety and quality assurance is more important? Or does price matter more to you? Whatever it is, a little competition is always a good thing. Competition should be healthy and fair. Regulations probably will and should come in to ensure the safety of all parties, and rules should be relaxed where they’re overly restrictive. 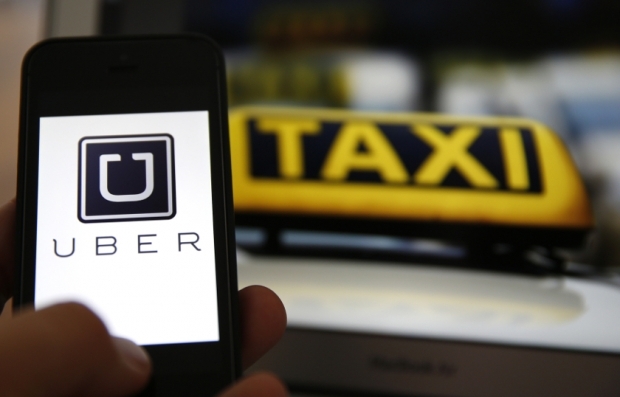 Third party apps like Uber and GrabCar have drastically changed the market. Taxi companies should aim to catch up rather than just cry foul. Other than facilitating the safety of commuters while they are traveling in taxis, the authorities also ensure that taxi drivers are getting their fair share of income instead of plying the roads in vain or just paying expensive rentals to taxi companies. It is great that NTA can embrace the new technology and evolving business models. After all, the goal of the NTA is to ensure a win-win for taxi drivers and PHV drivers who are both earning a living, while ensuring the safety and security of commuters. All in all, with an increasing array of transport choices and different organisations working to ensure that the necessary service standards will be followed, we commuters can expect a more pleasant journey in the days ahead! The cost of a taxi is 100-120k ;but rental is 4k. We should look into letting taxi drivers buy their own taxis. We have to drive 12 hours to make a decent living. Half of it is just to cover expenses incurred by those companies and lta and why charge us so much when we don’t have any benefits or not even an off day given. If I take a car to drive I must be driving 12 hours minimum for 30 days to pay rental or take a day off and work another day to pay 2 days. Getting a relief is difficult as they are very demanding and getting rare where as hirer pay pay and pay. I am returning my car soon. And soon many would return so they can make profit with their car alone. I don’t see why is there a need for uber or grabcar drivers to get a vocational license. Does Taxis drivers that have a vocational license is more safer than PHV drivers?? Phv drivers in fact offer much more better services. Current taxis drivers have to aim to give better services and not choose passengers. Don’t complain when competition is tough when it is yourself that is unable to keep up with the competition. If there’s a debate it will never end. 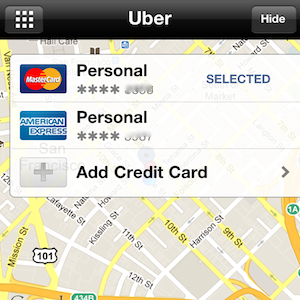 Uber says they are better than taxis and vice versa. Commuters just wait and see to reap more benefits and advantages. They will be spoilt for choice. At the end of the day various market forces will come into play. Who will prevail…PHVS or taxis? Only time can tell. i was told by a friend that once a Grabxcar driver picked her up but the photo shown in app and the actual person was not the same and in a different car. She questioned the driver and his reply was the car was in workshop.. That is really suspicious and risky for the passengers isn’t?? Taxi drivers can make all the noise they want about uber and grab being unfair and taking away their livelihood but in actual fact, they should be pointing the blame to their archaic, irrelevant, jurassic taxi company systems. These taxi systems are the lame ducks that have actually caused the downfall of taxi drivers. Firstly, since I was a teenager, I had always wondered why didn’t taxi companies provide their taxi drivers with GPS. I even asked a few drivers but they all told me their companies didn’t want to invest in GPS. Secondly, not all taxi drivers are uncouth but you do see a fair share of such people who just don’t know how to please others. Simple things like blaring the radio too loudly, playing songs which passengers don’t appreciate, talking to someone on the phone for long periods of time, driving in an erratic manner or jerking, speeding or driving too slowly, quarrelling with passengers, taking longer routes when there are shorter ones, etc. The list isn’t exhaustive. Thirdly, the blame goes to taxi companies again….for not changing with the times but stocking to ancient business models…like not making it easy for passengers to use credit cards, taxing a surcharge for passengers using credit cards, using can as the basic more of payment, insistence of taxi companies earning booking fees, charging taxi drivers high rentals, etc. Gone are the days of ancient business models. Companies like uber and grab only prove one very simple thing – taxi companies have not had competition at all in the past. So instead of crying foul, let’s see how taxi companies for this battle.